Let's Give A Hoot [H1012] - $6.00 : Yarn Tree, Your wholesale source for cross stitch supplies. Cross stitch chart from Imaginating. Designed by Ursula Michael. This adorable owl is just a hoot!! Words such as "smile," "be happy," "skip," etc. make up the design of the owl. 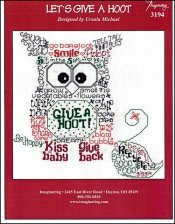 Now, "Let's Give A Hoot," & get this design stitched! Stitch count 130v x 129h. Stitched on #2936 Zweigart Aida 14ct White 59" wide or #8221 Zweigart Aida 14ct White 43" wide.